I do not do many of these projects, but enjoy the stone work. Where frost heave is less of an issue, I think I enjoy it much more! That is the case for this Brooklyn, New York City project. It hardly freezes deeply there, and by heave season, there's isn't typically any frozen ground at all. 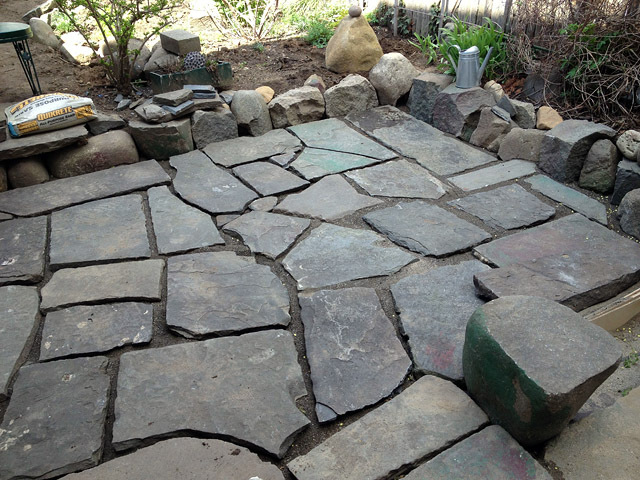 This project recycled all the slate found sitting under a few inches of soil. 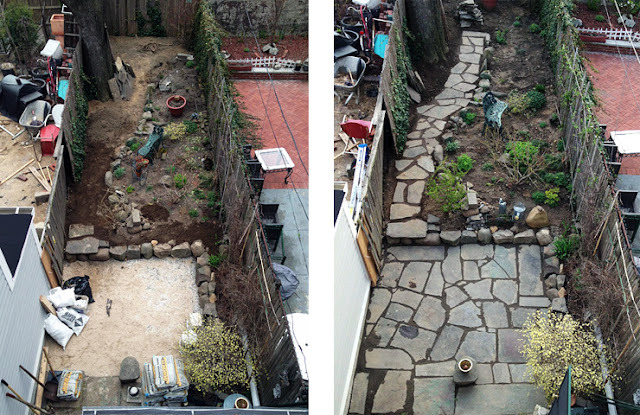 These covered over slates are more common in NYC backyards than you may think! 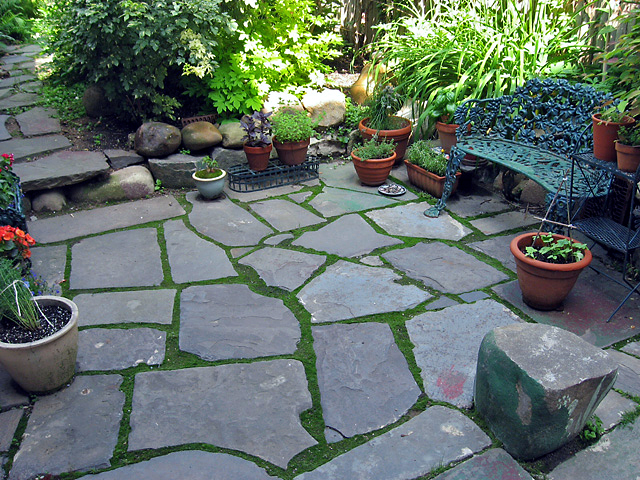 Fourteen months after building a client's reclaimed slate patio, the garden looks lush and so does the moss growing between the stones. 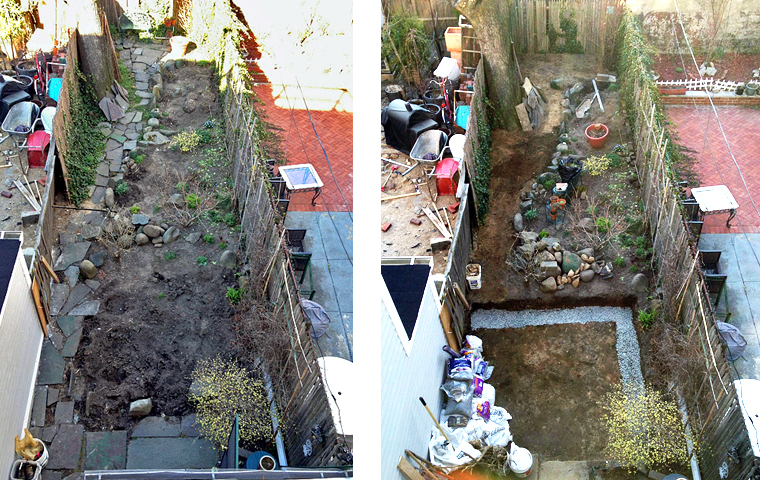 The Fort Greene, Brooklyn backyard looked like this when I arrived. 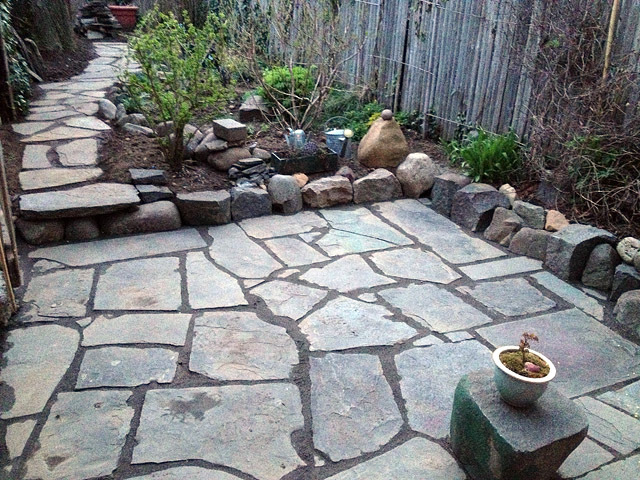 The owner had begun taking garden plants out to create space for the larger slate patio. The first task was to gather up all the available slate, removing it to an out of the way corner. 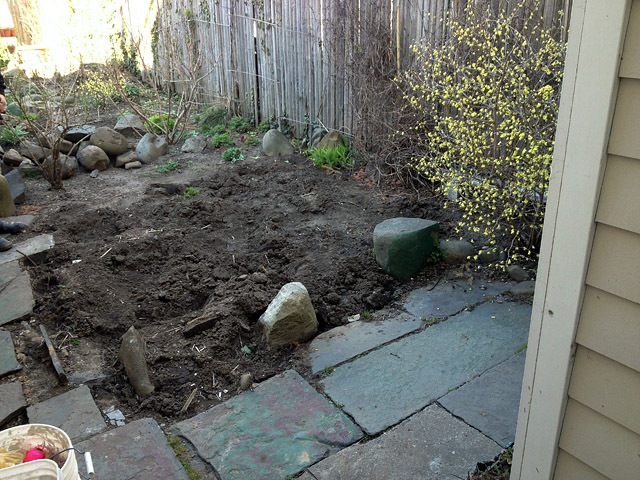 Afterward, I excavated soil from the roughly 240 square foot area, distributing it throughout the garden. 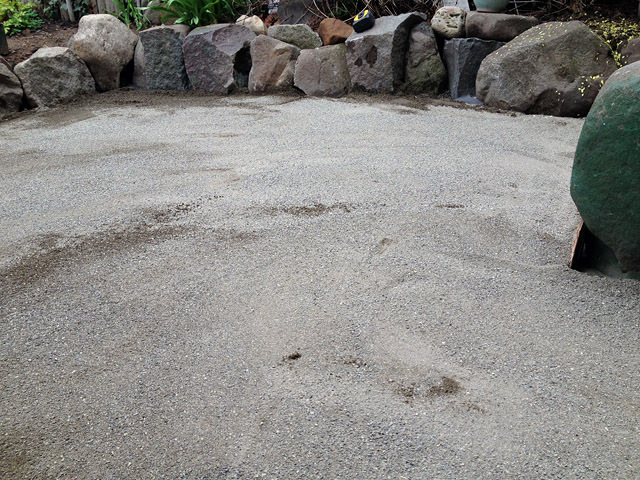 The perimeter of the new patio was excavated four inches deeper than the subgrade to accommodate the height of the large stones available for the retaining wall. 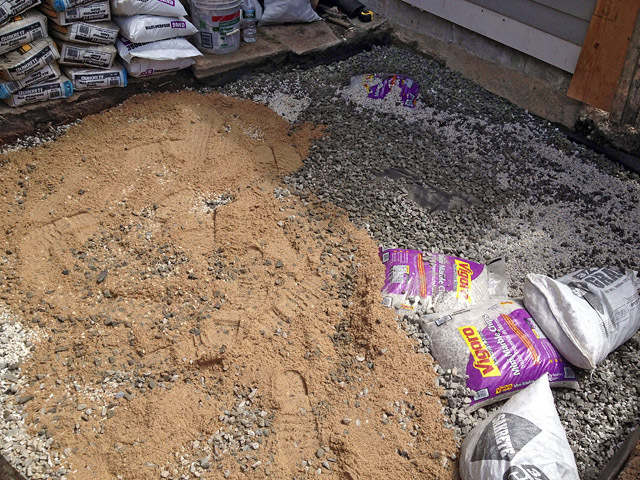 Bagged gravel and sand had to be hauled through the residence because there was no service passage to the backyard. 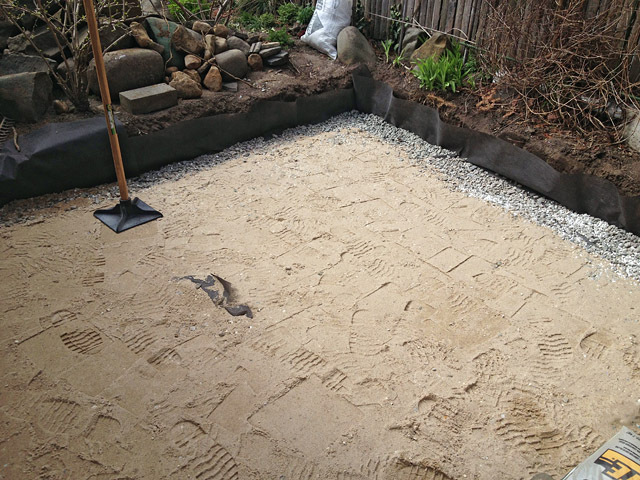 Although a Brooklyn backyard is unlikely to freeze deeply, I prefer the practice of preparing a tamped subgrade, gravel subbase, and course sand base to give the slate a sound foundation. 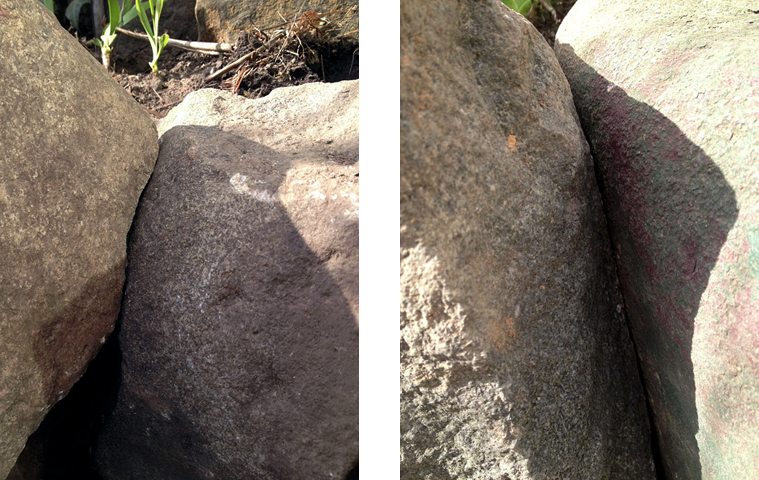 The dry laid wall required me to mate random, uncut stones. When working only with available on site materials, we can respect our achievements all the more. 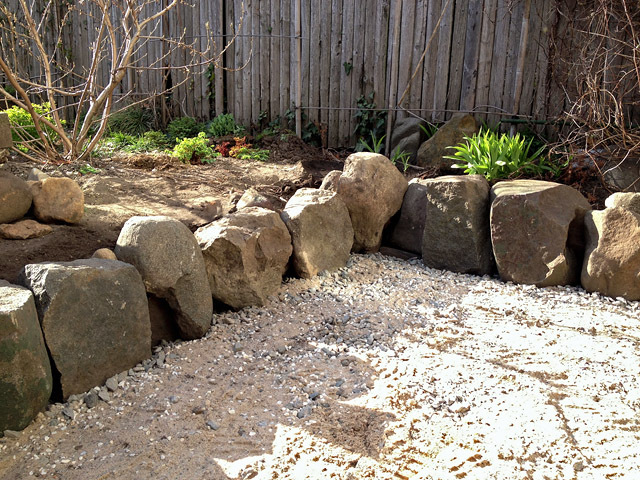 The client insisted on the placement of one large stone on the perimeter independent of the wall. 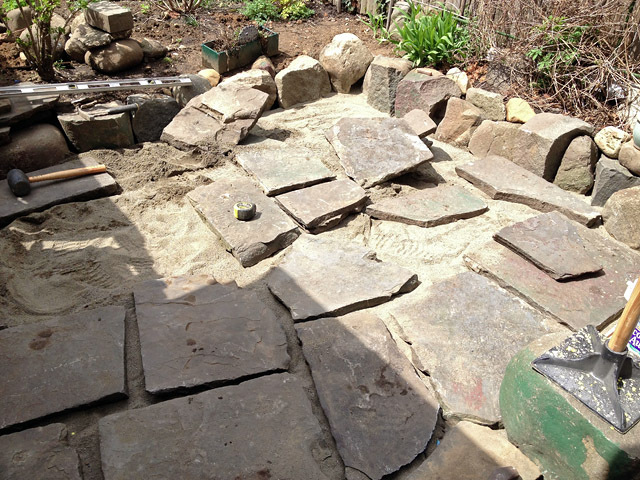 After the free-standing stone was set, the paver base was spread and readied for the slate. Dry laid stonework is more art than science. It takes patience and a willingness to rearrange what had already fit in place in order to achieve the whole. This is the essence of gestalt. 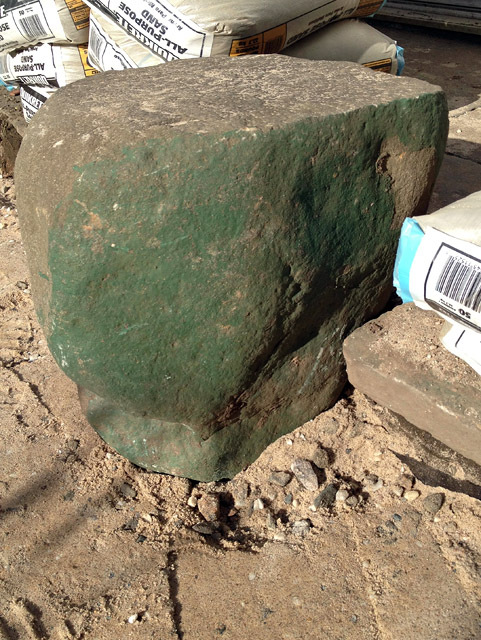 Leveling irregular stones is also an art where stones must be constantly lifted, crusher fines added or removed, tamped and tamped again with a rubber mallet. Once the arrangement has arrived at its best conclusion, crusher fines are added, in the manner of mortar, between the stones. The fines are hosed down a few times to force settlement, bring the grains tightly together, and clean up the dust left on the slate. Before and after the slate.